Posted on Sat, Nov 19, 2011 : 10:05 a.m.
That page-worn cookbook from the area’s thrift shop on your kitchen shelf or the recipe collection you turn to from a city’s Junior League share a powerful legacy. So demonstrates Jan Longone, an Ann Arborite, who was honored by the New York Public Library and the Culinary Historians of New York last week. In a lecture following the presentation in New York City to Longone of the prestigious Amelia Award (honoring lifetime achievement in the field of culinary history), Longone traced the history of community charity cookbooks, showing how they have affected women’s rights and the political landscape in this country throughout the last 150 years. 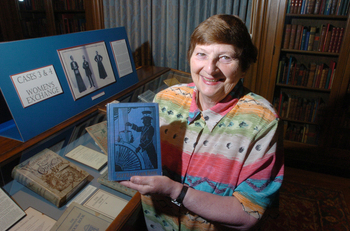 Jan Longone holds "The Suffrage Cook Book" in this 2008 photo. Early charity cookbooks were among the first projects organized by groups of women, often with their church to garner support for projects they felt were important. Longone points out that these cookbooks came at a time when women were without rights, without meeting places outside the home and without any networks comparable to “the old boy network.” They had no vote, had no control of money, were given no business experience, so publishing a group cookbook represented a coming together of interests, of finding a way to organize to raise money to support causes of importance to them. The cookbook production became a social phenomenon of the highest order, bringing women together in a new way that has continued to grow decade by decade. The desire to share recipes was there but an overriding hope was to promote their right to vote, to speak to equal rights for women, to raise money for soldiers injured in war or for other military, political, social or religious causes. It was the beginning step inthe establishment of the “Old Girl Network,” Longone asserts, and the empowerment of women. but only in school board elections! The community charity cookbook in the early years brought women together for a project that was their own and in which they organized themselves, sold advertising (often for goods that women made or wanted to sell), gave them business experience, made money and gave them a way to direct funds towards the causes they favored. A 72-year effort is mirrored in these community cookbooks regarding a woman’s right to vote. Later these cookbooks took on issues such as temperance, buying bonds, supporting the military, and a concept called the Exchange. The Women’s Exchange was a women’s invention in the late 1880s and supported a place in many communities and large cities, where women could bring handiwork (from jellies to embroidery) or other items to sell. These exchanges existed for decades and often had a luncheon area where women could meet, Longone explains, noting how these cookbooks, used to found the Exchanges, were a start of women’s clubs, “The Old Girl Network” and the empowerment of women. Women’s groups representing churches or synagogues through their cookbooks brought in and continue to bring in substantial amounts of money to support their projects. A Milwaukee cookbook, "The Way to a Man’s Heart” first published by the women of a Jewish temple there in 1901 to raise money for a Jewish settlement house, and is now in its 30th edition and its growth supports all charities in Milwaukee. She notes that in this book, the support for the cause continues although the recipes have changed: in 1901, the recipe for green beans called for them to be cooked for 1-3 hours; today’s version suggests simply 10-15 minutes. Another that continues today was started in 1903 to save artifacts and preserve landmarks in Southern California. Others were started in support of the New Deal. Those cookbooks supporting temperance were often concerned about that issue as those publishing them believed that women and children were the most affected by intemperance and the abuse of alcohol and used the charity cookbook to emphasize this. The community charity cookbook provided a way for women to support women and make clear their views on issues that affected politics, even constitutional amendments. Her passion for American culinary history has also led to Longone’s involvement in other projects including Michigan State University’s “Feeding America” website, which digitizes and makes available hundreds of culinary primary sources to anyone with internet access. She has organized two national symposia on American culinary history, bringing together scholars for a unique exchange of ideas. She writes and lectures widely and is an associate editor of the “Oxford Encyclopedia of Food and Drink in America,” an advisory board member of “Gastromica,” a quarterly journal for the scholarly study of food and food issues. She is also the recipient of the national Food Arts Silver Spoon Award. Catherine Arcure, is the former food writer of the Ann Arbor News. She now lives in New York City where she manages her businesses: Manhattan Manners, etiquette training for children and young adults; and The Protocol Professional, etiquette training for businesses and organizations. Sun, Nov 20, 2011 : 1:25 p.m. There's a Culinary Chat in Chelsea today (2-4) at the Chelsea Retirement Community Theater at 805 W. Middle St., presented by two volunteers with the Longone Culinary Collection at the Clements. Sat, Nov 19, 2011 : 10:25 p.m.
What a fabulous honor! How thrilling!!! Sat, Nov 19, 2011 : 7:25 p.m. It should be added that Jan has encouraged, inspired, and mentored young culinary historians who found this kind of support nowhere else in the beginnings of their careers. She is a fine teacher and lecturer. Sat, Nov 19, 2011 : 4:57 p.m.
Congratulations to Jan and Dan for this well-deserved honor! Sat, Nov 19, 2011 : 4:55 p.m. Sat, Nov 19, 2011 : 4:13 p.m.
Jan and Dan are awesome! Sat, Nov 19, 2011 : 3:17 p.m.
How lucky we are that Jan is a local person and that she has gifted all of us with her collection of culinary gems by giving them to the Clements Library at UM. As the economy remains down, the frugal cook can look back in the history of cooking to days when things were much like they are today and see what the housewife did with far less than we are used to using. Our granddaughter had the experience of seeing what came to the table in a country that uses what is growing locally, now, while in Africa on her UM Medical School rotation. No cucumbers from Argentina, no greens from California, no grapes from Spain, just root vegetable and such. It wasn't so long ago that our own kitchens were run on what was growing here and now, or could be kept in cold storage.